The eight members of the expedition "In the Footsteps of Two Captains" in Naryan-Mar. Expedition leader Oleg Prodan is third from left. Photo from the expedition's Facebook page. Three people died in a helicopter crash during an expedition to find a schooner lost in the Kara Sea in 1914. A helicopter with three persons crash-landed on Monday on the island of Bely north of the Yamal peninsula. The helicopter was part of an expedition to search for the remains of the schooner “St. 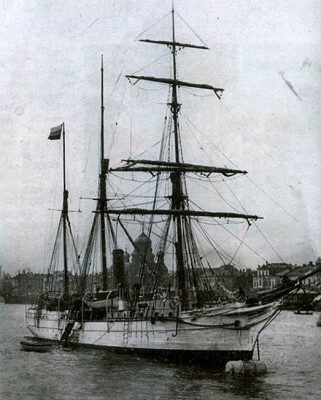 Anna”, lost more than a century ago as it sought to explore the Northern Sea Route, the Siberian Times reports. It was bad weather in the area when the accident happened. Two other helicopters from the expedition had landed safely at Sabetta airport while the third helicopter left for reconnaissance and was lost on the Arctic island of Bely. The three people killed in the accident were Director of the National Park Onezhskoye Pomorie and expedition leader Oleg Prodan, aircraft commander Alexey Frolov and navigator Mikhail Farikh. gunvessel “Svyatya Anna”, which had become stranded in ice on an ill-planned expedition led by Captain Georgy Brusilov. The vessel set out from Alexandrovsk (today the submarine base Polyarny) on the Kola Peninsula in August 1912 and disappeared without a trace after having being locked in the polar ice for at least one and a half year. Only two of the 24-man crew of “St. Anna” survived. They were among 11 members of the crew who in April 1914 abandoned the ice-locked vessel and set out across the snow drifts seeking firm land. Their desperate trek was depicted in the popular novel “The Two Captains” by the Russian author Veniamin Kaverin. Earlier searches for the vessel, including one by Norwegian Otto Sverdrup, had been unsuccessful, and its fate was not known until 2010, when the now late Oleg Prodan led an expedition that found skeletons, a journal and other artifacts from the vessel on Franz Josef Land.